What Isuzu Phils Corp. began last June, it followed through by rolling out more units of modernized public utility vehicles. This time, IPC led the historic turnover of 15 units of its modernized public utility vehicle at the iconic boundary of Manila and Quezon City, two of the country’s most important cities. The turnover, led by IPC president Hajime Koso, was attended by Manila Mayor Erap Estrada and Quezon City Mayor Herbert Bautista, IPC President Hajime Koso, and officers of the transport group Pangkalahatang Sanggunian Manila & Suburbs Drivers Association (Pasang-Masda) led by its president Obet Martin. The 15 modernized PUVs have been assembled using the Isuzu QKR77 cab and chassis platform and the rear body designed and manufactured by Almazora Motors Corp. The units are Sanden air-conditioned 23-passenger Class 2 PUVs with a side-facing seat configuration. The new PUV body is compliant with Philippine National Standards (PNS 2126:2017). The passenger cabin floor-to-ceiling height and gangway width are 1,780 mm and 830 mm, respectively, providing more space for passengers to move easily inside. The passenger door is safely situated on the right-hand side, facing the sidewalk. Other design features of the body include panoramic windows and windshield, full-body insulation with GeneQ shield, automatic door closer, ECE-compliant headlamps, brake sytem, wipers, windshield washer, and side view mirrors, and provision for persons with disabilities. Completing the modernized look and features of the new PUVs are the LCD/LED TV monitors, electronic signages, fire extinguishers, GPS navigation system, CCTV, dashcam and back-up cameras, and an automatic fare collection system (AFCS) installed by Euodoo Inc. All of these have been geared for passengers' safety, entertainment, and added convenience in fare collection. The new PUVs also come with separate warranty coverages for cab and chassis (3 years or 150,000 km, whichever comes first) and body and aircon, options not available for old jeepneys. In a symbolic gesture of cooperation among local government units and the private sector, the two motorcades originating from the city halls of Manila and Quezon City converged at Mabuhay Rotonda, where the seven modernized PUVs from Manila and the other seven from Quezon City finally joined an Isuzu PUV on display at the Rotonda. Later on, at the press conference at the Luck Garden Restaurant in ---, Mr. Koso reiterated IPC's commitment to help modernize the Philippines' PUVs. "What IPC started for the Senate's transport cooperative last June 18, we continued to expand to other key strategic locations in the country such as Iloilo. Now, we bring the efficiency, safety, and comfort of our Isuzu modernized PUVs right at the heart of the country's vibrant socioeconomy, where an efficient public transport system is most needed." 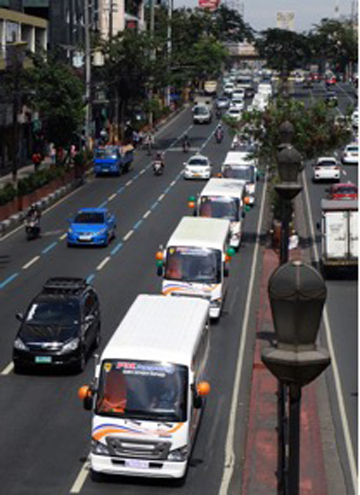 The route/s that the 15 modernized PUVs will ply would be the Manila City Hall to Quezon City Hall and vice versa. The government's Public Utility Vehicle Modernization Program (PUVMP) is envisioned to replace some 200,000 jeepneys nationwide 15 years and older with new, safe and environmentally friendly public utility vehicles.